T.B. Quat | Pro Chem, Inc. 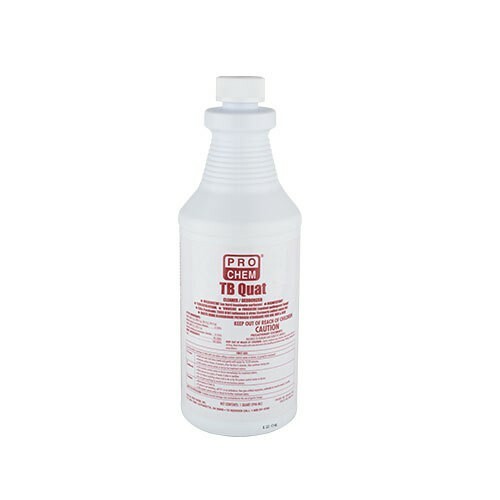 This product is designed specifically as a general, nonacid cleaner and disinfectant for use in homes, hospitals, nursing homes, patient rooms, operating rooms, ICU areas, schools, food service establishments, transportation terminals, office buildings, manufacturing facilities, lodging establishments, retail businesses and athlete/recreational facilities where housekeeping is of prime importance in controlling the hazard of cross contamination. It is formulated to disinfect hard, nonporous, inanimate environmental surfaces: floors, walls, metal surfaces, stainless steel surfaces, glazed porcelain, glazed ceramic tile, plastic surfaces, bathrooms, shower stalls, bathtubs and cabinets. For plastic and painted surfaces, spot test on an inconspicuous area before use. May be used in the kitchen on counters, sinks, appliances and stove tops. A rinse with potable water is required for surfaces in direct contact with food. 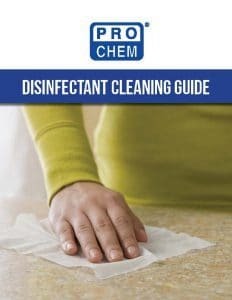 In addition, this product deodorizes those areas which generally are hard to keep fresh smelling, such as garbage storage areas, empty garbage bins and cans, basements, restrooms and other areas which are prone to odors caused by microorganisms. Cooling Coils Disinfectant Cleaner: This product is a ready-to-use, one-step disinfectant cleaner for HVAC cooling coils and refrigeration equipment evaporation coils. When using this product to disinfect and clean cooling coils, disconnect power to the unit before applying product. Disinfection, Deodorizing and Cleaning: Remove gross filth or heavy soil prior to application of the product. Hold container 6-8 inches from surface to be treated. Spray area until it is covered with the solution. Allow product to penetrate and remain wet for 3 minutes (for Blood-borne Pathogens: allow surface to remain wet for HIV-1 1 minute and for HBV and HCV 5 minutes). No scrubbing is necessary. Wipe off with a clean cloth, mop or sponge. The product will not leave grit or soap scum. One-Step Cleaning and Disinfection of Toilet Bowls and Urinals: Remove water from bowl by forcing water over trap with a swab mop applicator. Press swab mop against side of the bowl to remove excess water from applicator. Apply 1 to 2 ounces of this product evenly, allowing sufficient time for product to cover entire surface of bowl for maximum cleaning. Swab bowl completely using a scrub brush or toilet mop, making sure to get under the rim. Let stand 3 minutes (for Blood-borne Pathogens: allow surface to remain wet for HIV-1 1 minute and for HBV and HCV 5 minutes) and flush. To disinfect food service establishment food contact surfaces: countertops, appliances, tables, hold container six to eight inches from the surface to be treated and spray area until it is covered with the solution. Allow product to penetrate and remain wet for 3 minutes (for Blood-borne Pathogens: allow surface to remain wet for HIV-1 1 minute and for HBV and HCV 5 minutes). Wipe off with a clean cloth, mop or sponge and thoroughly rinse all surfaces in the area with potable water. Heavily soiled areas must be precleaned before using this product. Do not use on eating utensils, glassware and cookware. Tuberculocidal Activity: This product exhibits disinfectant efficacy against Mycobacterium tuberculosis BCG (Mycobacterium bovis) at 20 degrees Centigrade when the treated surface is allowed to remain wet for 5 minutes. *Virucidal Activity: This product kills on hard, nonporous, inanimate surfaces when allowed to remain wet for a 10 minute contact time against: Poliovirus Type 1 (ATCC VR-1000), Canine Parvovirus (ATCC VR-2017, Hepatitis A virus (HAV). This product, when used on environmental, inanimate, hard surfaces, exhibits virucidal activity against: Hepatitis B virus (HBV), Hepatitis C virus (HCV) and Bovine viral diarrhea virus (BVDV) when the treated surface is allowed to remain wet for 5 minutes; Human Coronavirus (ATCC VR-740), SARS associated Coronavirus, Avian influenza A (Avian influenza strains H3N2 and H9N2) for 2 Minutes: Paramyxovirus (mumps) (ATCC VR-1438), Rhinovirus type 39 (ATCC VR-340) and Rotavirus for 3 minutes; HIV-1 (associated with AIDS) for 1 minute (60 seconds); and Norovirus (Norwalk virus), Feline Calicivirus and Rabies virus for 30 seconds. Kills HIV-1, HBV, AND HCV on precleaned, environmental surfaces/objects previously soiled with blood/body fluids in health care settings (hospitals, nursing homes) or other settings in which there is an expected likelihood of soiling of inanimate surfaces/objects with blood or body fluids, and in which the surfaces/objects likely to be soiled with blood or body fluids can be associated with the potential for transmission of Human Immunodeficiency Virus Type 1 (HIV-1) (associated with AIDS), Hepatitis B Virus (HBV), Hepatitis C Virus (HCV). Special Instructions for Cleaning and Decontamination Against HIV-1, HBV and HCV on Surfaces/Objects Soiled With Blood/ Body Fluids. PERSONAL PROTECTION: When handling items soiled with blood or body fluids use disposable latex gloves, gowns, masks or eye coverings. CLEANING PROCEDURES: Blood and other body fluids must be thoroughly cleaned from surfaces and objects before application of this product. CONTACT TIME: Allow surface to remain wet for HBV and HCV 5 minutes, for HIV-1 1 minute. These contact times will not control other common types of viruses and bacteria. DISPOSAL OF INFECTIOUS MATERIALS: Blood and other body fluids should be autoclaved and disposed of according to local regulations for infectious waste disposal. MILDEWSTAT – To control mold and mildew on precleaned, hard, nonporous surfaces spray surface to be treated making sure to wet completely. Let air dry. Repeat application at weekly intervals or when mildew growth appears. FUNGICIDAL ACTIVITY – This product is fungicidal against the pathogenic fungus, Trichophyton mentagrophytes (ATCC 9533) (athlete’s foot fungus – a cause of ringworm) when used with a 10 minute contact time on clean, nonporous, hard surfaces as found in bathrooms, shower stalls, locker rooms or other areas commonly contacted by bare feet.